Twin Lakes can be reserved for private events. 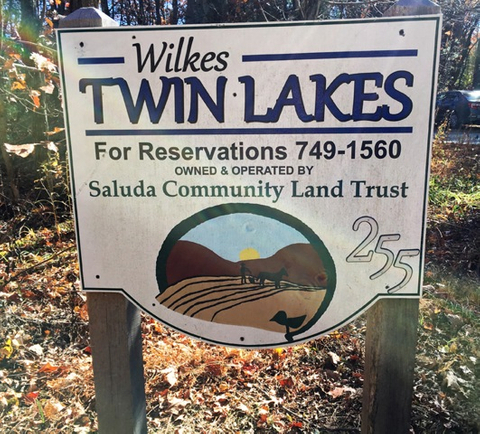 SCLT requests a donation in exchange for use of Twin Lakes facilities and land. All of your donation will be used to maintain the beauty of Wilkes Twin Lakes, so we hope you will be generous for this worthy cause. Twin Lakes is only accessible by reservation or during special event days. Please use the calendar above to plan accordingly. If you need to see Twin Lakes for your planning, please contact Holly Wilkes for access. Directions: From railroad tracks in Saluda head up Greenville Street 1.7 miles to a left turn at the Twin Lakes sign, Linda Ln. Continue down gravel road thru gate to parking area. Greenville Street changes name to Mountain Page Rd at county line. From the watershed at state line it is 2.1 miles on Mountain Page Rd. to the right turn at Linda Ln. and Twin Lakes sign. Continue down gravel road thru gate to parking area.